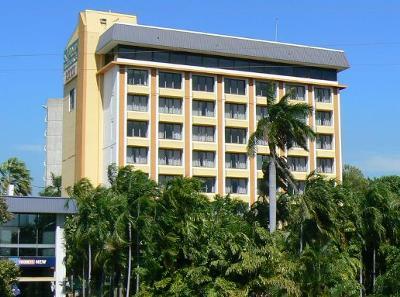 The Frontier Hotel is located about midway between Darwin Mall and Mindil Beach. This puts just about everything in the CBD an easy walk away. Overlooking the Golf Club, Casino, Mindil Beach and Botanic Gardems, the rooftop restaurant provides an unrivaled view to enjoy your meals with. 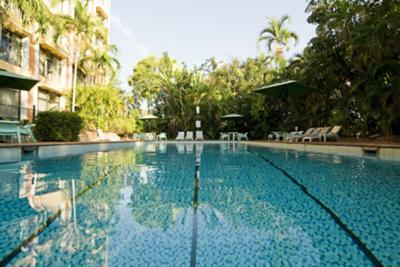 The Hotel has a variety of rooms with 40 doubles, 34 twin rooms and 11 Quad rooms. 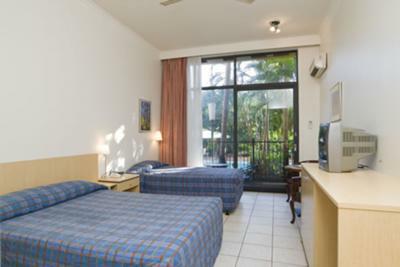 There are also 6 one bedroom apartments located on the 6th floor. The Punters bar is agreat place to relax with counter meals for lunch and dinner available daily from an extensive menu with plenty of cold beverages. Gaming options are aplenty - from Keno, TAB and Poker Machines with two different linked Jackpots. Multiple TV screens to catch all the action that Austar can deliver. All in a non smoking environment. But most importantly a vast selection cold beverages packaged and on tap.